Reading University Caving Club is one of the most active clubs at Reading, meeting each week, and spending at least three weekends away each term. Over the past year we have managed 23 caves, 8 big social events and 36 different pubs between us. Membership is open to both students and the general public. Pleasant though the town of Reading is, it is somewhat short of caves. We will therefore typically arrange three or more weekends away each term, to some of the most beautiful parts of the country, including the Yorkshire Dales, Derbyshire, the Mendip Hills, Devon and South Wales. We realise that a whole weekend is a big commitment, particularly if you’re new, but it does give much more opportunity to get to know people and go a bit further afield, and often it’s just nice to get out to the countryside for a change. We meet every week on a Monday from around 8:00pm onwards – please see our Facebook group or our event calendar for the location of our next pub night. If you’re not sure where to find us, get in touch, and we can help out. This is your chance to find out what trips are planned and engage fellow cavers in a spot of intellectual chat. RUCC has a large supply of caving gear in our tackle hut, so if you’re new to caving don’t worry – we have all the equipment required; protective clothing, helmets, harnesses, ropes as well as rigging guides, maps and books. For more information what you will need on a trip and to see what gear the club provides go to the gear section. The club makes several bulk orders during the year for which it receives a discounted price, so if there is any equipment you would like to add to our order list either personally or something you think the club should buy please notify the tackle master. If you are interested in caving and wish to join please visit the Join Our Club page, or simply e-mail the president and they’ll let you know what you need to do. For anyone new to caving, we’ve tried to answer some of the common questions in our ‘Frequently Asked Questions’ section, but the best way to find out more is to come along to a trip or social event. Please get in touch if you need to know anything else. 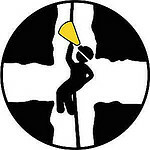 The club can offer training for trip members in ladder climbing, and insists upon training members in Single Rope Technique before they go underground on ropes. The training takes place at a number of locations, and is performed by our instructors. It is always a relaxed atmosphere with no pressure and will be arranged around whenever you can make it. We sometimes go for a drink at the pub afterwards. For training we will normally meet at the club’s Tackle Store and then make our way to the training location. Socialising and being nice to each other is a major part of the club, and an activity that we like to practice a great deal. We think we are one of the more sociable clubs at Reading, and lots of events are held each term, for example the Christmas party, Sweeney Todd’s pie eating evenings, curry nights, scavenger hunts, quiz nights, and other trips to the pub. We’ve also been known to ice skate, climb, surf, skydive, ski, mountain bike, get into fancy dress and fall over at each other’s parties. See our Photos section to see some of results of these activities… We also provide a ready-made crowd for activities such as the Reading beer festival, jazz festival and so on. You’re also more than welcome to join the club’s Facebook Group. Here you can interact with club members and find out what’s being planned in the club. In addition, news of upcoming events are shown on our event calendar – also check the calendar at the top right of every page. Or alternatively, why not come to one of our regular Monday evening meet-ups, and find out what’s happening in person? I am a member of the berkshire bat group and have been contacting people recently who may have any ideas of mines within berkshrie that we may be able to discover rare or hibernating species of bats as we hope to get more records within berkshire and as we have recently become very active with many young enthusiastic members. Some very agile we are interested in seeing whether you have any details? James – thanks for your enquiry. I’m not personally aware of mines with rare bats in Berkshire – however I’ll certainly ask around, as there may well be someone in our club who does know about this… I’ll let you know what I find out!